I am trying to use PowerCli to list all datastores assoicated with a cluster then list the datastores capacity, amount of free space and "provisioned spaced". From what I have read I many need to use the get-view command with I have not used before. I am not strong in powercli so looking for some guidance on this. Here is a script that provide you that information. $pwd = "vCenter user pass"
Are you copy the full script like it is? Because I don't get any error when I run that script. where are you running the script? Are you using a tool like PowerCli Script Editor? 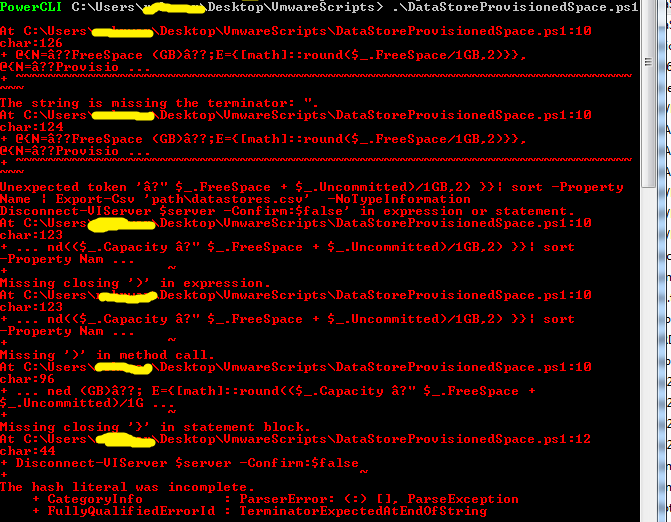 Or are you just copy into PowerCli shell console? I tested again with a script editor and in PowerCli shell it works perfectly. I copied and pasted everything from you using posted and tried in in PowerCLi and Windows Powershell ISE both getting the same error. Witch version of PowerCli do you have? Please tried again, then take a printscreen of the shell console with all the steps and upload here please. That doesn't show me anything, because you are using a script file. I was talking running the script/commands directly in the console. When I say sensitive information, is like user/password, IP addresses of vCenter etc. Then upload here that file script. I am sorry for the delay in getting back to you. I was out of the office sick and catching up on items and will look at this tomorrow. Thank you so much for you help as always. I am sure this is 100% user error on my part. But did you manage to put the script to work? The script like that have an error. Like I said you need to change the path for where you want the report be saved. The path you should add where you want save the file. When I change that, it runs without any error. You cannot put directly to the c:\, you need to add to a folder. But when we save directly to the drive the error should be different. Like this: Export-Csv : Access to the path 'C:\datastores.csv' is denied. Test with a folder please. But that "Missing closing '}' in statement block" is killing me. Ok I may found the problem in your copy/past script. Not sure, but I have seen this before. Because when we copy/past sometimes the quote get changed. Run again and let me know. same error and need to go through the script in detail again. Do you have a PowerShell/CLI editor like PowerGUI Editor? If not, can you download and use it and run the script from there? Did you try to test this in a different computer? By the way, what is your PowerShell version? Just to make sure, I switch computer (from my home lab) , to my company computer and run the script against one of the Production vCenter, and again works. Sorry that you weren't able to put the script to work. Have you try in a different computer? ?